than Ziggy, and I think she thought that looked scary. Sally, our latest addition to the family. Labels: Animal portrait. Ziggy in snow. Acrylic on mounted birch panel. Barbara Muir © 2014. Toronto. Canada. That is a wonderful portrait of Ziggy, her owners will be so delighted. 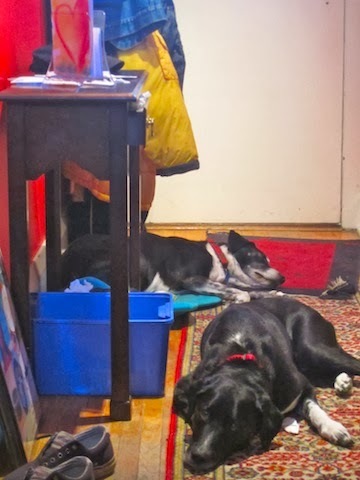 The photo of zoey and ziggy in the hallway, looks like one of your paintings, with all the lovely primary colours in it. I spent yesterday thinking about all the wonderful/silly/funny things Ziggy would do like lick my ears (which tickled and made me laugh), shove her snout between my legs while making snorting sounds, and sense when I was sad or upset and try to comfort me. I can't believe I almost forgot about how she used to slide down the park hill on her back! Thank you for reminding me of that wonderful memory, and for painting this beautiful portrait of her. She looks so youthful and vibrant, it's exactly how I want to remember her. Thank you. I'm so glad you like it. The photo of the girls in the hallway is colourful, but a little bit sad, because it was the last time the two really got to spend time together. They were lucky to be owned by friends, and that they got to care about each other all of their lives. Thank you. They were super dogs. We bought them when we saw a notice about Labrador/Border Collie pups in the supermarket, and our kids insisted we go and see them. They were actually Labrador, Border Collie, Dalmatian, so they were fast runners, smart and calm in the house. All good. I've been thinking of you all day today. What a great dog Ziggy was, and I will miss saying Ziggy! and having her press against me. She was so smart, and both of those dogs cared about how we were feeling. I'm glad you like the painting. Hope to see you soon and give you a hug. At first I thought I was looking at a portrait of Zoey. There certainly is a striking resemblance between the two. I love the soulful, mournful look in Ziggy's eyes - You really nailed it - I also love the way you actually seem to be stroking Zigg's hauntingly beautiful head with your brush. Great names - Ziggy and Zoey - and now you have Sally - that's good! What a sweet face. Dogs are the best. Must love dogs! There were small differences. Zoey was more Dalmatian, Ziggy more Lab. But they were a lot alike. I'm glad you like the brushwork. Dear Ziggy. I miss her. The thought of never seeing either of those girls again is distinctly unhappy. Sally bounding down the yard today in three leaps is a very good distraction. And she is a sweetheart too. we can love both. So I'm happy I do. ~Hugs~ to you and your critters. and it's a lovely portrait of your sweet 'niece' Ziggy. She did feel like a niece in dog land. We used to celebrate the dogs' birthday on February 20th with a barbecue in a local park in the snow. It was a lovely community event, with lots of people and their dogs celebrating.